Me too. Those are powerful words. And not just in relation to the #metoo movement. Women are definitely having a moment and finally being heard about things they felt pressured to keep secret for far too long. But one of the reasons these women feel empowered to come forward is the support of others with common stories. Universally, we seek out “me too” moments. We feel instant connection when we realize that someone thinks like us, acts like us or owns a shared experience. For those of us in the Dravet Syndrome community, Facebook groups throw us a “me too” lifeline. Parenting a child with a life-altering and life-threatening condition proves lonely and isolating. But through the magic of social media, we interact and engage with others in the same boat. We sympathize, we grieve, we question and we advise. And when times are tough, that “same boat” can be a life boat. With permission, I share a comment from a new friend (she has a 17 year old son that could be my Shelby’s twin) on a Facebook group for parents of Dravet children ages 16 and up. “So tired of reading things like ‘are there any Dravet kids that are normal? '” I don’t know how many pieces my heart broke in to after reading this. I’m still picking them up, which is why I knew I needed to write about this. That and the fact that two days later there are 106 comments on the thread. There are only 157 members in the group. Oh, I remember so clearly being a young mom (What? It wasn’t THAT long ago.) of a constantly seizing toddler praying that she would be healed and live a “normal” life. But oh, how I relate to the insult of someone hoping and praying that their child doesn’t turn out like mine. It’s such a painful dichotomy, and yet I now also see it as a beautiful dichotomy. For years, people have called me when a young child of someone they know starts having seizures. I have even served as a peer mentor at the local children’s hospital. The request is always the same. “Would you be willing to talk to ____. They are so scared and have so many questions.” My answer is always, “Of course – IF you think they would really benefit from talking to me.” I have a lot of experience and knowledge to share, but I also know that my story is not necessarily a comforting one to a mom on a new journey. At 17, Shelby operates on the level of a 2 year old. She wears diapers, braces on her ankles, and sleeps in the same room with my husband and me. She will never drive, marry or live independently. 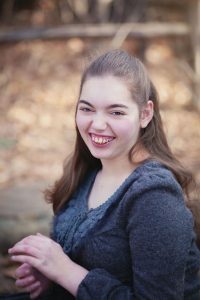 Although Shelby began having seizures at 5 months of age, she was not officially diagnosed until 8 years of age. Many of us with young adult Dravet kids share this experience due to the rarity of the disease. I have always viewed Shelby’s late diagnosis as God’s great gift to me. He knew I personally could not handle the grimmer realities of her disease at a more tender age. He gave me time to learn and discover some of these things on my own before seeing it in black and white. Although I do know that earlier diagnosis now means better treatment options and more educated parents (which is so great), I remember my own feelings of hope when Shelby was younger and her deficits weren’t as noticeable. I desire to always treat gingerly the hopes and expectations of another. And then…I have a day like I did last week. I honestly told my mom that I feel sorry for families that don’t have a Shelby. Really! Another Dravet mom said that a younger parent asked her what she had done wrong so she could avoid the same mistakes with her own child. I’m sure she asked the question out of a combined sense of fear and the best intentions for her child, but how hurtful. To insinuate that any child is an error to be avoided – so disparaging. Have you met my kid? She is the sweetest, most tender, incredibly joy filled person I know. She possesses an innocence that’s endearing, a laugh that’s contagious, and a hug that is inclusive and all-encompassing. She has taught me more about unconditional love than anyone outside of Jesus Himself. She is never disrespectful, argumentative or hurtful. She is incapable of lying and never throws attitude. All parents should be so lucky. Dravet Syndrome comes with an intense list of physical, financial and emotional challenges. As parents we live with serial grieving as we watch peers move on, and we must constantly adjust our dreams and expectations on any given day. These things I would not wish on anyone. But Shelby is not a mistake. No one wears that label. God “fearfully and wonderfully” made her. He knit her together in my womb and His works are wonderful! (Psalm 139) As one mom put it, “define normal?? Ohhh someone who is NOT as fabulous and unique as [my child]?? ?” Exactly. God knew before the creation of the world that my daughter would be the cause of some of my deepest heartaches and fears and greatest joys. He knew that she would love Elmo and Mickey Mouse and give the world’s best hugs. He knew she would never meet a stranger and would wear as many watches at one time as we would let her. He knew she would love to make silly noises and never kiss, but love to cuddle. He knew she would sit on my lap until she was entirely too big and that her daddy would make her laugh more than anyone. He created her just as she is. And the Bible tells us He looked at all His creation and deemed it “very good” (Gensis 1:31). Love this Lauren! Your words echo so many of my thoughts! I’m truly blessed to know you and Shelby on this journey! Thank you, Lisa. You are always an inspiration and breath of fresh air to me. Thank you for your friendship. Lauren, hi! Thanks for coming over and introducing yourself this morning. I am touched and inspired by your story and the way you are reaching out to others with hope and joy. Thank you, Linda. And I appreciate you visiting back! Thank you. Xo. Just thank you. Our children are not meant to be looked at and avoided. They are inspirational, and pure. I love your line about lifeboats. We, as older moms, sail in these lifeboats of support… saving each other and our children as Dravets waves, crashes and storms come and go. A life preserver, a lighthouse of hope, understanding and knowledge… we all need this. Many of us sailed all alone far too long before we found out what sea we were even sailing. I love your thoughts about the time it took for diagnosis as a blessing . We traveled the US for nearly 9 years to find a hope, a diagnosis…. As you know, when you find this one, it is not what you hoped to find, but it is the reality to deal with. Like you, I could not have handled that diagnosis sooner ( I barely handle it now). But I needed that time to slowly accept this journey, before a diagnostic label was placed on it. Thank you for so eloquently sharing your story, and the journey we share!!! Do you write, Michele? You have such a beautiful way of putting things. I look forward to our continuing new friendship. What a beautiful uplifting post. So many moms need to hear these words of encouragement. Thank you, Mandy. I really appreciate you reading. fearfully and wonderfully made caught my eye. I love that. I also was called to children hospital and as I sit in the family area working and praying for my God-Father’s healing and recovery. I thought Id catch up. I already told my pastor so many doors are flying open I dont have time to get in trouble. I appreciate your courage to share and empower and press through the fear and dismay of wondering how you could possibly help but wonderfully you manage to show courage, hope, and empower others in difficult and trying situations. its wonderful for me today, because a good friend of mine is with his 1 day old grandson born yesterday at 10 lbs, i guess two days old now, and i received news on our prayer line that another friend lost her seven year old son in a car accident. So im sitting here in the midst of joy and sorrow, with tears of healing for the family that loss there child, and celebrating for the birth of another. I tested my heart today to be sure I heard right. Visited my God father today, but all I could do was sing and pray in tongues, and say good night. Now I know for sure it was my own heart that couldn’t stay away, and it wasnt the medication speaking. He really doesnt want any visitors so he can concentrate gain his rest and strength for rehab. funny thing is even though im not needed. I have to respect and accept his decision and im sitting two feet away from his room in the family area. At least I know now for sure not to return until I get the call. Visiting here made me realize how much i miss working at childrens hosptital. a gf called last night and said your not going to waste get in touch with Healthcare christian fellowship. I see you going on a mission. Funny thing with her im always reluctant, and she always seems to get the first call from God. Fearfully and wonderfully made. I love that God made us that way, gives me permission to be human, and grow deeper in his love and graces. Be blessed in all you do and are. Love and Blessings Nancy. “Normal is someone NOT as unique and fabulous as my child.” That is definitely Shelby (my granddaughter) AND her mother (mg daughter). Love you both! Thank you, Mama. Love you and thank you for being such a supporter. This is so good. It’s appalling the way that so many react or speak without thinking to families and even the dear young ones who fully understand their belittling. I dare say I’ve been as guilty as many others, but I’m grateful for the voices of wonderful parents and advocates like you, who can sing of the blessings and joys of these precious ones. Thank you, Cindy. I really appreciate you reading and offering me encouragement.